Once, I read a story about a little horse that was staying in a warm and cozy place. He was safe there and didn’t want to leave. Suddenly, he saw a tunnel of light and felt a force pulling him out of his shelter. He was so scared; he thought he was going to die. And then he found out that he was just being born. The moment of birth is the first moment of separation. It must be horrifying for a baby to come out of its mother’s belly into such a strange place: to breathe air and to hear, smell, see, and touch the craziness of a new world. Our birth, which is the most natural thing in life, is also a scary and painful experience. With the first breath, the human heart is broken. And then, duality spreads its wings. The story of love and pain, connection and separation, light and darkness, unfolds in time. Yet, it is not easy to see pain as natural. Why? Because it hurts! And our deepest desire is to be happy. A paradox of human life is that avoiding pain is as natural as its existence. In the animal world, the escape from suffering is the immediate reaction to it. Rumi, a thirteenth-century Persian poet, said: “Stay with the pain. The wound is the place where the Light enters you.” This statement may not seem logical. Why should we stay with the pain? Why should we suffer? The wound is present in every human heart… it is growing and aching from the moment of our birth. We can try to escape it by using anything the world offers us: food, drugs, work, sleep, alcohol, a hyperactive lifestyle, and other strategies. But finally, it leads to even more suffering, loneliness, and separation. By avoiding pain, we multiply it. It is not necessary to be in a concentration camp to experience the ultimate depth of human pain. Every day people commit suicide because of unrequited love, health issues, financial crisis, loss, rejection, and loneliness. There are moments in life when suffering seems unbearable. My friend Susy from Mexico City lost two children to incurable diseases. She didn’t have any other children. Her pain was unimaginable. She told me that in her darkest moments, she still had a choice. She could choose between hate and love. She could reject life, people, mothers, and children or embrace everything. She decided to love and the magic happened. She radiated so much light that her son’s friends sought out her presence, friendship, and advice. Her house was full of young people. She posted a picture of her daughter’s wheelchair on Facebook, offering it to anyone who needed it. The picture was shared over one million times and many parents of sick children wrote to Susy asking for the wheelchair. With the help of her friends, Susy collected money to buy more wheelchairs and ended up creating a foundation that helps poor and sick people in Mexico. In honor of her children Diana and Daniel, she named the foundation Dianel. Every conversation with Susy is magical; it feels like crossing the boundaries of the ordinary world and diving into a planet with different rules: a kingdom of giving. Her boundless heart has become the source of miracles. Her Facebook messages inspired a mother who hadn’t seen her daughter for over twenty years to visit her, make peace with her, and meet her grandchildren for the first time. The Dianel Foundation is constantly growing, bringing help and relief to the lives of hundreds of people in unexpected ways. Susy has become a rain of light, but the pain and the longing for her children hasn’t disappeared. The wound is constantly present, even when she laughs, sings, and dances. At times, life hurts so much that even the act of breathing is painful. We seem to be inside a dense cloud that absorbs every ray of light. There is only pain, spreading through every cell of our being. The only thing we want is relief from our suffering. At any cost, even the cost of our life itself. Outside everything might seem fine. We might not be able to explain to others why we are suffering. They wouldn’t understand. But, we feel it with every breath. Void, fear, loneliness stir inside us. The dark space in our souls wants to be acknowledged, accepted, and honored. Yes, the pain is there. Yes, it hurts. Our bodies express it. Tears fall. And this time, we stay with the wound. Without anesthesia, we enter our broken hearts. It is just us, being human. It is us, facing our humanity, experiencing its very core. It is us, exercising our highest freedom: the freedom to choose our attitude. It is us, expressing our greatest courage: the courage to feel the depth of our hearts. Surrendering to life, with both its light and darkness, is a path to the secret mountain that changes our vision of the human drama. It is a door to the deep understanding that love goes beyond life and death. It is stepping into a reality that cannot end. Poets and mystics perceive human suffering as the echo of the pain of separation from God, the Heart, our deepest Essence and most intimate Truth. They see it as an expression of the desperate longing of the human heart for the Infinite. We cannot avoid or escape pain. But, we can witness it in meditation, listen to it, and discover God’s voice in it, yearning for us and calling us to Him. In the depths of our soul, we can hear the torment of a lover who is desperate for union with the beloved. If we surrender, this longing will become our guide to a Reality in which life and death disappear in an eternal embrace. Beata is a Hridaya Yoga teacher. You can read her reflections on the 49-Day Prathyabhijna Retreat here. Hridaya Yoga will offer “From Pain to Peace,” a 3-day practical workshop on the art of transforming suffering into awareness, October 21-23, 2016. You can book your place here. 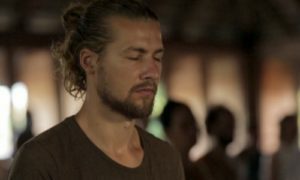 Silent Meditation Retreat in Spanish: Found in Translation What Is Tantra?